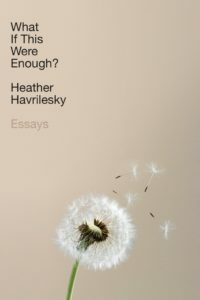 One of my favorite authors is Heather Havrilesky. Her style is an enviable combo of wit, depth, tragi-hilarity, and sublime sensory writing. “My mother’s house has loud plumbing. There is a musty smell to most of its rooms. The screen doors don’t close completely, leaving a crack where bugs can crawl in. In the summer, there are large flying insects waiting on the front door when you get home at night. The front yard is covered in clover but very little grass. The windows are big and the frames are rusted metal and hard to crank open. My mother’s house is not air-conditioned. She is one of the last humans alive in the swampy North Carolina heat without any relief beyond whirring fans. There are tiny spiders that live in the corners and no one kills them or cares that they’ve taken up residence there. There are windows with glass so old it looks a little warped. There are pine needles in the gutters. The shutters need painting. The bathroom could use a wastebasket. In the bathroom cabinets, there are bandages and Epsom salts and weird brands of shampoo like Body on Tap that date back to 1987. When I visited a few months ago, I found a little jar of Vicks VapoRub that looked like it had been excavated from someone’s garden sometime around 1975. If you’re interested in developing your sensory writing skills, take a look at my next Come to Your Senses Writing Retreat.